Hi, it’s Jeni with a beautiful card using the latest Stamp Of Approval box – Adoring You. I love keys! So this had to be the first stamp set I used! There are four clear stamp sets, one red rubber stamp (a gorgeous scripty font style background) and one die in this box. The add on dies are for three of the stamp sets and a stand alone decorative tile die. I show an unboxing in the video which you can see by clicking HERE. Onto the card. I stamped all the locks and keys in The Keys stamp set with Icing On The Cake ink. The Keys dies can be kept together so I trimmed out my stamped images and lined them up with the die and used some purple tape to hold them in place while I diecut them. I go into more detail about this on the video tutorial. I white heat embossed the Love Notes background stamp and used Sugared Lavender ink to add the colour over the embossing. I started with the foam blending tool off the card and slowly and lightly brought it onto the card to build up some colour. I love the Love Notes background. I can see so many vintage distressed backgrounds coming up soon! I added the colour unevenly to make a nice vintage distressed look. 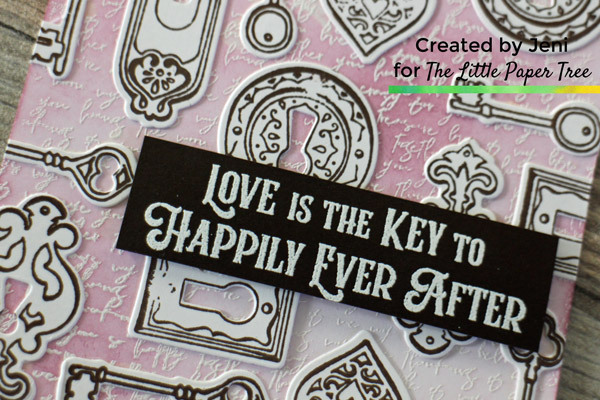 I started to arrange my keys and locks in all different directions then decided on my sentiment. I tend to leave the sentiment to the end (so sometimes I have trouble fitting one in). 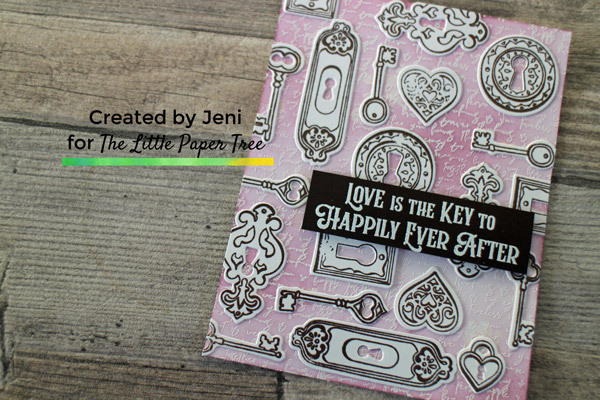 I used the sentiment “Love Is The Key To Happily Ever After” and white heat embossed this on brown card. I added some foam tape to the sentiment strip and lightly pushed it down to pick up some of the locks and keys. I used Tombow Mono Multi glue (with my precision tip) to adhere all the keys and locks down then trimmed off any overhang and adhered it to a card base. I’d love to see what you make with the products in this Stamp Of Approval box. Please share your makes with us over at the Facebook group and use the #thelittlepapertree so we can find and like them. Love these key stamps and dies in this SOA collection.